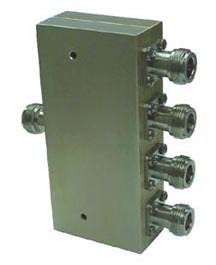 The MDI 4-way RF power divider (splitter) and combiner line operates throughout the 0.5 GHz through 26.5 GHz range. Standard input power rating for most models is 30 Watts average, though power ratings up to 1500 Watts average are available on some models. We will also be pleased to work with you to provide custom units, meeting specifications demanded by your application. Standard connector configuration is female connectors at all ports. Consult factory for custom configurations and connectors. Standard input power rating for most models is 30 Watts avg. Higher power ratings available on some units. Consult factory.